Paul Sheehan was arraigned in Dorchester District Court on Monday. He was the person caught on a video taken by an African-American woman who was one of the targets of his tirade . The video, posted on Facebook over the weekend, has gone viral. It shows Sheehan challenging the woman about why she is in his neighborhood and screaming at her and a Boston Police officer who intercedes. In the video, the man calls the motorcyclists “animals” and threatens them with violence if they didn’t “get out of [his] neighborhood." The incident began about an hour after a car pursued by police smashed into a second car and a fence  at the corner of Beaumont Street and Adams Street. 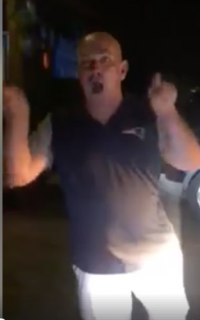 The confrontation shown on video happened just feet away from the scene of the collision, which was followed by a foot chase and the arrest of a 31-year-old Dorchester man, who was allegedly fleeing police after striking a pedestrian on Dorchester Avenue.